"It cannot be disputed that the State Government was entitled to make a choice to purchase the Helicopter in question. There is nothing on record to show that the Helicopter could have been procured for lesser price. No person claiming to give a better deal has come forward. Thus, in absence of clear evidence that loss was caused to public exchequer by way of commission payment to Sharp Ocean Investments Limited which was only a route to send the payment to the son of the Chief Minister, interference by this Court is not called for," the Bench comprising Justice A.K. Goel and Justice U.U. Lalit observed. The Court further opined that there was no prima facie material to hold that the beneficiary of the transaction was Chief Minister of Chhattisgarh Mr. Raman Singh's son, Mr. Abhishek Singh. It, therefore, observed, "We do not consider it necessary to go into the allegation of mere procedural irregularities. We broadly find that no case is made out for interference by this Court for issuing a direction as sought in absence of allegation of extraneous consideration being substantiated." Having considered the Petition on merits, the Court did not examine the objection raised on behalf of the State that the Petitions were filed for political gain and should not be looked into, observing, "There is no doubt about the legal position enunciated in the said decisions cautioning the Court against interference with decisions of the Executive without there being clear issue of genuine public interest. However, they do not create a jurisdictional bar, if conscience of the Court is pricked in a given case. A petition under Article 32, without clear element of public interest, cannot be entertained at the instance of a political rival merely on account of an alleged procedural irregularity in the decision making which can be challenged at appropriate forum by the aggrieved party." The Court was hearing Petitions filed by Swaraj Abhiyan and a few others, alleging that a VIP helicopter was purchased by the State in a "dubious manner by floating a sham tender", contending that one person represented all the three competitive bidders. The deal, they contended, caused a huge loss to the state exchequer. The Petitions alleged violation of the Chhattisgarh Procurement Rules, contending that the tender was floated despite there being no decision on why the State must purchase only that particular model of the company. The original proposal, they claimed, had suggested that proposals be invited from different manufacturing companies. The Chief Secretary Aviation Dept., Mr. S.V. Prabhat, they said, had in fact approved a proposal to publish a global NIT for any helicopter with required specifications, without mentioning the name of a particular company or model. They alleged that despite this, the tender issued and published was only with respect to Agusta A-109 Power (Elite). The Petitions had now relied on documents procured through RTI to further contend that the payment of 1.324 million dollars was made over and above the price of the helicopter. They claimed that the States of Jharkhand and Rajasthan also purchased Agusta A109 Power without any tender around the same time, but at a lower price. They, nevertheless, sought an inquiry into similar purchases made by several other States such as Jammu and Kashmir, Rajasthan, Punjab and Jharkhand. The Petitions had sought investigation into the role of Chief Minister of Chhattisgarh Mr. Raman Singh's son, Mr. Abhishek Singh in the impugned deal as well. They contended that an offshore bank account in Abhishek's name had been opened in British Virgin Islands, which is a tax haven, in July, 2008, which was around the same time when the helicopter was purchased. 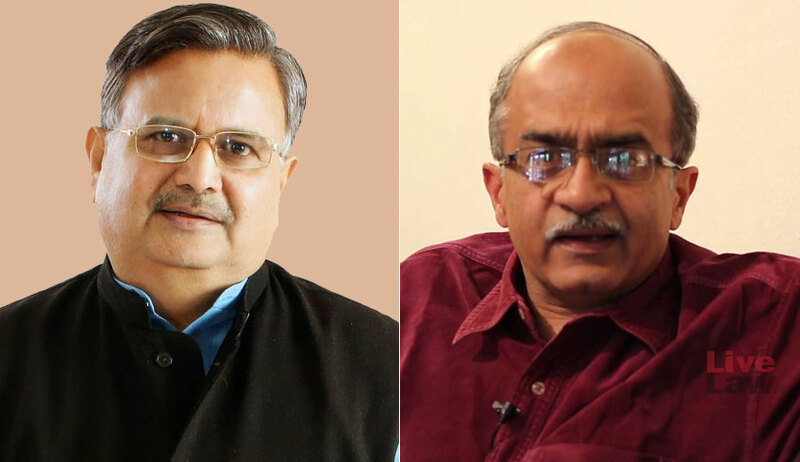 The Petitions then relied on information revealed by the International Consortium of Investigative Journalists (ICIJ) website to contend that the address for the said account was actually Mr. Raman Singh's permanent address. "There is a strong possibility that the money paid as commission in this deal as well as in other similar transactions have ultimately reached to this bank account of “Abhishek Singh”," the Petitions had alleged.